Reed Mariculture / Reef Nutrition has announced the release of their new Beta-Brine™ prepared & enriched adult brine shrimp fish food. This new offering is available starting August 5th, 2013, and expands Reef Nutrition’s existing lines of macro-feeds for fish and invertebrates. 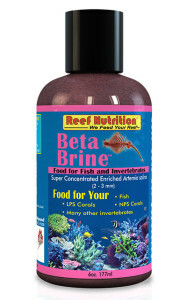 Reef Nutrition’s new Beta-Brine™ fish and invert food. Other foods in this line include R.O.E. Real Oceanic Eggs™, Arcti-Pods®, and Mysis-Feast®, as well as herbivorous offerings Macro-Feast® and Fuzzy-Phytes®. 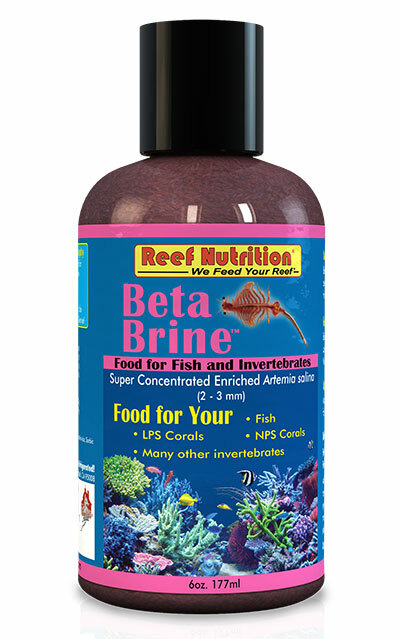 Beta-Brine is super-concentrated enriched Artemia salina. Beta-Brine Artemia are naturally enriched with beta-carotene because they feed on phytoplankton (Dunaliella) that has exceptionally high beta-carotene content. Beta-Brine Artemia have been aquacultured in Western Australian salt ponds, distantly located from urban population centers and pollution sources. Beta-Brine Artemia are harvested while actively feeding upon marine phytoplankton for maximum nutrition. No freshwater phytoplankton has been added.